Below are the offspring that helped her earn this special award. We are so very proud of Missy and all of her kids!!!! and has the most beautiful, eye-catching side-gait...smooth as glass. lovely Sammy face with structure/movement to match. a 5 pt major the day after the Arizona specialty---completely out of coat. and presented us with 5 lovely babies on August 1 2009---3 boys and 2 girls. Missy's kids from her first litter are doing well. She has two champion sons: Joey, CH. Firecloud's Joe-kers Must Bee Wild and his litterbrother, JJ, CH. Firecloud's I'm Not Your Average Joe. 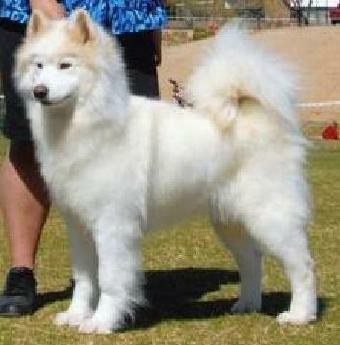 and Frankie, CH.Firecloud's Luck Bee a Lady. For her second litter Missy was bred to Peet, CH.Firecloud's Devilish Hot Cuppa Joe. 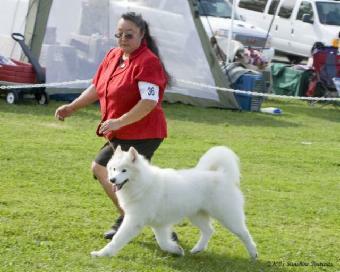 and a champion daugther, Jasmine, CH. Firecloud's Heavenly Sweet Cuppa T.